1. Small talk makes you unbelievably uncomfortable. You need something that is going to engage you otherwise the conversation feels like a waste of your time. It could be time you could be lost day dreaming in your own head instead of awkwardly laughing at a joke you didn’t even find funny. You want meaning and you want depth to a conversation. You want to find out who a person really is, not hear the generic lines we use to everyone we pass by. 2. You either want to be surrounded by everyone or no one. You find yourself buried away in your bed with a book and music turned up. You don’t want to answer any texts, you don’t want to leave the house and you want to cancel all your plans. Then you have days where you get bored if you’re home alone for five minutes. You’re either one extreme or the other, there is rarely an in between for you. 3. Your thoughts consume you. You live inside your own head. You are constantly thinking of places you’d rather be or you’re brewing up new ideas. You think about plans you made or how you’d rather be home when you’re with your friends. You think about everything from being lonely to being in love with your life. Your mind always races a million different directions, but these days you find a certain comfort in it. 4. Having too much time to make a decision is your worst nightmare. You love to go out, but when it comes down to it you also love a chill night at home. If you’re given too much time to decide it becomes a constant battle in your own head between what you actually want to do. You’re torn between possibly going out and craving being home or vice versa. You never want to miss a good night out, but the problem is you never know what nights will be good or not. You want to speed up at the same time you want to slow down. 5. Being in a group of people you don’t know makes you rather uncomfortable. You love company, but you love company from the people you know. Once you’re in a big group of strangers it tends to make you awkward and gives you a bit of social anxiety. You don’t know what exactly to do or say, but you’re always worried about saying the wrong thing and embarrassing yourself. 6. You enjoy being alone, but you hate being lonely. I don’t think anyone truly enjoys the feeling of being lonely; frankly because it’s a sucky feeling. But there is a clear difference between being alone and being lonely. You can decide to spend the day alone with yourself and enjoy it. You can’t control being lonely, it hits you like a wave crashing against the shore in a storm that just doesn’t stop. 7. You love listening to others. You could sit down all day and listen to someone tell you interesting stories. You love feeling emotionally connected to others, you love feeling like you’ve stepped into a chapter of their life and you love being the ear they need. Listening to others share their stories and allowing themselves to become vulnerable in front of you makes you feel humbled and special to them. 8. Maintaining friendships isn’t one of your strengths. As outgoing as you are and as much as you love finding others to connect with you have a more difficult time maintaining your friendships. Sometimes it’s the lack of energy you feel in reaching out to them, other times it’s that you’re constantly meeting new people and trying to maintain friendships with everyone is exhausting. You’ll always be a friend to these people, but sometimes you lose relationships in the maintenance aspect. 9. You’re selective on who you really let into your life. You’re a very deep and sensual person, you feel things deeply and you love hard. You open your arms to everyone who needs you, but you’re also selective on who you actually let into your personal life. You don’t like negativity and drama so you try to steer clear of the people who bring it. You only really want people who you have an emotional connection with in your close inner circle. 10. You blend very well with each personality type. 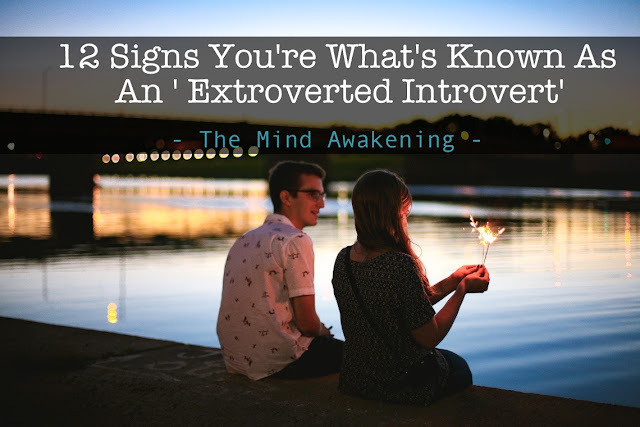 You have friends that are clearly extroverted and friends that are clearly introverted and you mesh well with both. You’re also kind of the middle ground between both to keep everyone from killing each other (not literally). 11. You are super flexible. You are the best of both worlds. You can have just as much fun going out for ice cream as you can going out to a bar. You are laid back about most things and almost prefer to have others make plans for you so you don’t have to decide what you’d rather do. 12. You can empathize with people. You are in tune with your emotions, probably because you spend so much time in your own head analyzing things, but you feel for other people. You have no problem putting yourself in their shoes, in fact you kind of like doing it. You try to be as level-headed as possible and see things from every angle before you make assumptions.